On display will be the state-of-the-art SVR123SP computerized knitting machine that features a special loop presser bed, capable of producing hybrid inlay fabrics with both knit and weave characteristics. Demand for such novel fabrics is very high across a wide range of applications, from fashion apparel to sportswear, innerwear, outerwear, uniforms and other functional clothing, as well as home furnishings and technical textiles. 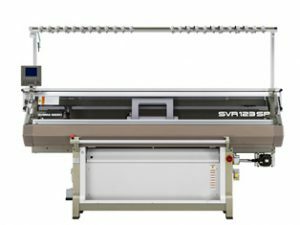 Focusing on the sportswear manufacturing market in Indonesia and neighboring South East Asian industries, the SVR123SP at Indo Intertex furthermore features the new i-Plating option, capable of alternating yarn colors in any pattern, producing jacquard-like designs using plain jersey stitch. With i-Plating, plating can be performed within the same course and for individual needles for even greater diversity in knit design. The latest sportswear samples produced on SVR123SP will be on display, as well as the revolutionary seam-free WholeGarment knitwear featuring superior fit, comfort and style that are ideal for sportswear. The latest version of Shima Seiki’s 3D design system SDS-ONE APEX3 will also be exhibited.